Derek LOVES lasagna. In fact, it is his favorite food. And after 2 1/2 years of marriage I still haven’t made it for him. I guess my excuses have been it takes too much time and cost too much money. This past weekend my friend moved away and gave us a lot of cheese so the first thing I thought of making was lasagna. I remembered a recipe I have from a ward cookbook for skillet lasagna. I knew it was easy and I had heard it was amazing so I made it. And let me tell you! It was so good! 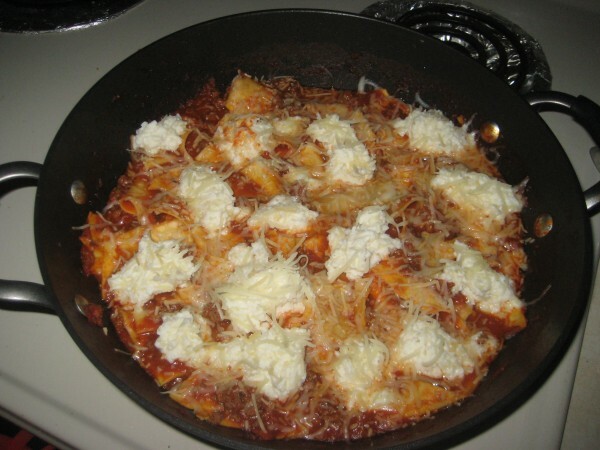 I like lasagna but it isn’t my favorite but this skillet lasagna is really good! And Derek loved it too! And he knows a good lasagna when he tastes one. The best part is how quick and easy it is to make. This is now one of our favorite recipes! In large skillet over medium heat, brown meat and drain. Add pasta sauce and 1 1/2 cups of water, bring to a boil. Add noodles and stir. Reduce heat and cook for 10-12 minutes. In a bowl combine ricotta and 1 cup Italian cheese. Drop cheese in mounds around noodles. Sprinkle with remaining Italian cheese. Cover, turn off heat and let sit for 5 minutes. what a great looking dish! This time of year is the perfect time for such a warming hearty dish! Thanks for sharing!! I agree this looks amazing! This will definitely keep the chill away. Welcome! Lasagna is expensive but this looks way good, gotta make some !